I would suggest not, and using a couple of examples from Poole Museum and Towner Gallery this blog post explores a number of effective alternative online platforms. I tell someone about my research into online museum experiences. They respond with wow, that sounds so exciting have you seen what (insert name of any large museum here) does, we’d love to do that but we don’t even have a website. So I set out to find museums and galleries who use free online platforms that they edit in house to create an exciting online presence . I wanted to have some brilliant examples ready for the next time I get myself into this conversation. However I was surprised by how hard a task this was, it seems that if a museum doesn’t have a website, then it won’t have any social media presence. Why is this? Well from conversations with staff in small museums it seems that there is a fear off the internet. Often people will use social media personally, but using it in work requires approval from senior management, risk assessment new policies and procedures. Indeed some council run museums noted that due to firewall restrictions they can’t even access social media, blogs or any non official sites. I’ve even heard a story of a museum employee who works at home one day a week so that they can do all the online stuff that the council firewall stops (from updating Facebook, to checking out relevant blogs). Should museums push beyond these barriers and utilise social media when a website isn’t an option? The following two case studies discuss this questions and highlight the possibilities and limitations provide by social media as a stand alone online presence. 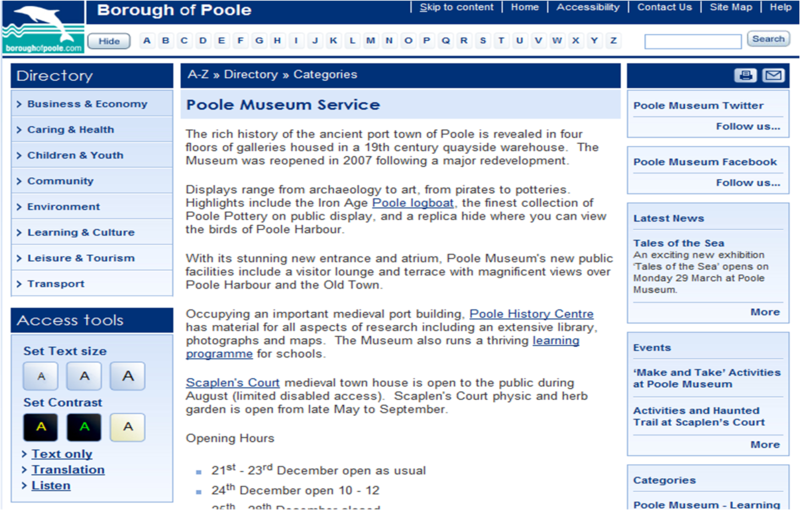 Poole Museum has a few pages on a council website, but these are very cold and corporate. The pages list opening times, but do not portray the community nature of the museum, the diversity of their collection or prompt people to visit. Michael Spender, Museum Manager responded to this limited online web presence by creating a Twitter profile. Whilst Poole would love a shiny new website, time and money prevented this from happening and Twitter offered an exciting alternative platform. Michael said ‘I aimed to target two audiences, the sector (stakeholders, museums, other institutions, regionally, nationally and internationally) – essentially advocacy – and the local community in Poole, Bournemouth and Dorset. So far this seems to be working fairly well, and tweets are deliberately aimed at these two audiences’. Using culture hashtags such as those created by Culturethemes Poole Museum has been able to raise their profile with those that are culturally engaged.Poole have also utilised the community nature of social media to reach out to new audiences by tweeting about broader community issues. For example in response to heath fires @PooleMuseum retweeted tweets from the local fire service. Whilst Twitter has been a really useful platform for Poole , Michael points out ‘It is still an experiment, and we are only starting to feel an impact on things like attendance at events, volunteering and the like, but one which has the potential to have really measurable benefits’. Social media is not a quick fix, but if a museum is truly committed and is willing to experiment it can become a useful way to connect with museum audiences, and indeed to develop new audiences. 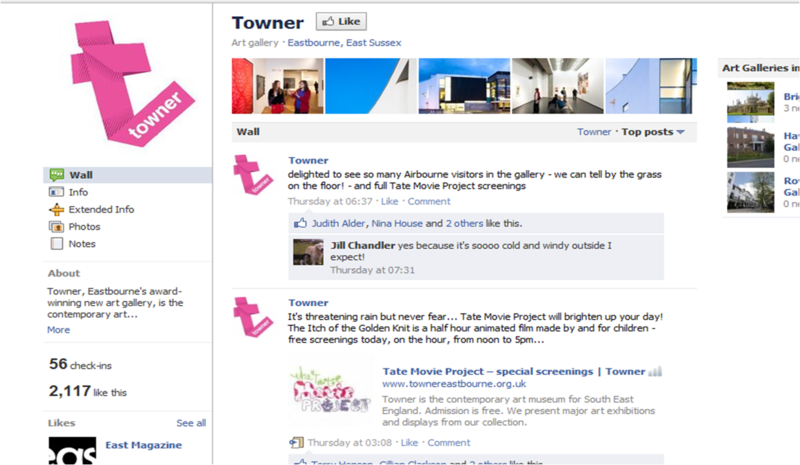 Towner opened 2 years ago in 2009, and relied heavily on Facebook and to some extent Twitter for these first two years. ‘We made a conscious decision that instead of feeling disadvantaged by lack of a dedicated website, we would use the opportunity to try and maximise our social media presence’. The team approach to administering the page allowed the gallery to utilise skills that are not part of peoples job remit. Gilly noted that the success of their Facebook page is in part due to a dedicated member of the Front of House Team who did a lot of work on the Facebook page in their own time. 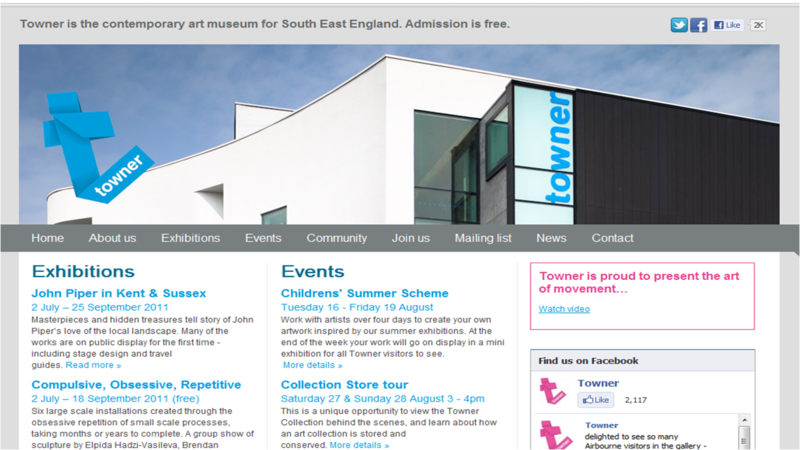 Towner launched a website in July of this year. Their new website has been heavily influenced by what they learnt about online engagement through their Facebook page. Furthermore their new website is a wordpress based site which they were able to build at a low cost. WordPress is a popular blogging platform, which can also be adapted to build websites. As Towner were heavily involved in the development of their own website they know how it works and therefore have a large degree of control over how to manage its layout and edit its content. Having a website provides Towner with new opportunities, and indeed combats some of the access and control issues of Facebook. However Gilly said ‘We hope that people will go to our website for more information, but will continue to interact with us through the primary medium they use on a daily basis – Facebook’. So I guess in conclusion I think it is fair to say a really engaged Facebook, Twitter or Blog is far better than a dull out of date website or indeed no website at all. My blog is read by those that follow me on Twitter, often museum professionals who are already engaged in digital museum practice. I guess you could say I am preaching to the converted. So please do email this article to colleagues not on Twitter. Yes, ofcourse they need a website. See http://www.museumjocas.nl van Historisch Museum JoCas the first en biggest virtual historical museum in the Dutch language.